X-ray Image Credit: NASA / CXC / ISDC / L. Pavan et al. Explanation: The Lighthouse nebula was formed by the wind of a pulsar, a rapidly rotating, magnetized neutron star, as it speeds through the interstellar medium at over 1,000 kilometres per second. Some 23,000 light-years distant toward the southern constellation Carina, pulsar and wind nebula (catalogued as IGR J1104-6103) are indicated at the lower right in this remarkable image from the Chandra X-ray Observatory. 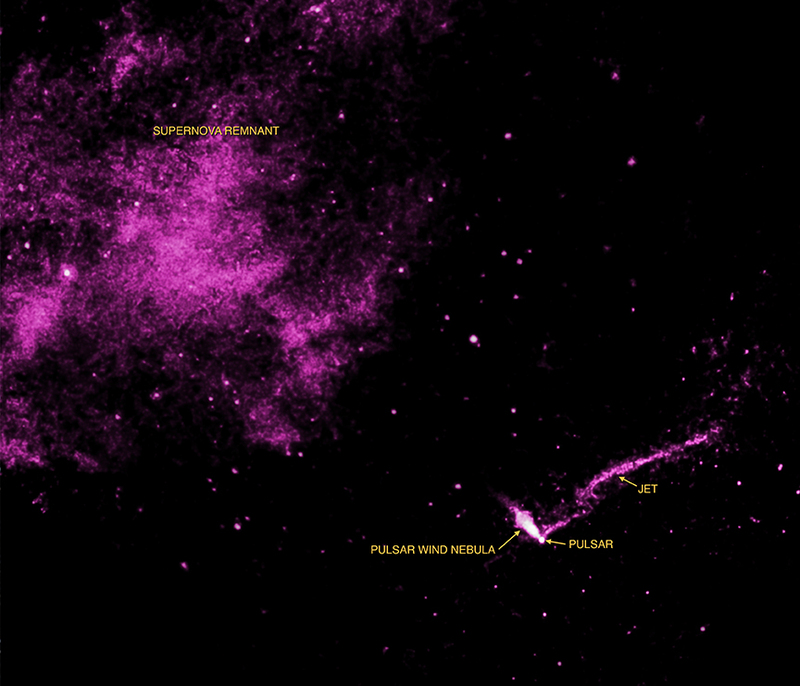 Energetic particles generated by the pulsar are swept back into the wind's comet-like tail trailing up and to the left, along the direction of the pulsar's motion away from its parent supernova remnant. Both runaway pulsar and expanding remnant debris field are the aftermath of the core-collapse-explosion of a massive star, with the pulsar kicked out by the supernova explosion. Adding to the scene of exotic cosmic extremes is a long, spiraling jet extending for almost 37 light-years, but nearly at a right angle to the pulsar's motion. The high-energy particle jet is the longest known for any object in our Milky Way galaxy.